You see how European Propaganda (you call it education), taught to you by real teachers, since class one, since Sunday school, has turned you into? You see how sober, quiet and peace-loving you have become in the face of your own violent death? You see how loving, forgiving and pious you have become while the devil takes your land and kills your babies and murders your unborn babies? You see how docile you have become while the devil cuts your balls? The Cathedral is going up, isn’t it? And there’s nothing you can do about it. Can you? You see how docile, meek and lamblike you have become? You see your manhood? The Cathedral is going to be built with your resources, and it will be maintained every year with your resources even-though you don’t have food to eat, you can’t feed your family, you don’t have medical care, you can’t afford vital medicines, you have no place to lay your head or even a latrine to use. You still owe the public bathroom where you take showers once a week. But you see how obedient, plaint, dutiful and peace-loving you have become? After all these years of someone else always taking your resources for free, and leaving you to suffer violent deaths, violent diseases and such, you are still praying to God. After all these years of someone else always taking your resources for free, and leaving you with a Bible, a Church, a Mosque, here and there, to suffer violent deaths, violent diseases and such, you still pray? You see what a European education, a European mission school, European books, European languages and European appetites can do to you? You see? You can’t even find your balls! Our Manhood has been turned into Cissyhood. Period. We have a problem as Africans and can’t blame everything on the European. Misplaced priorities should not be blamed on European education. My friend, I have not blamed a single European. So what has the European Education done to us? 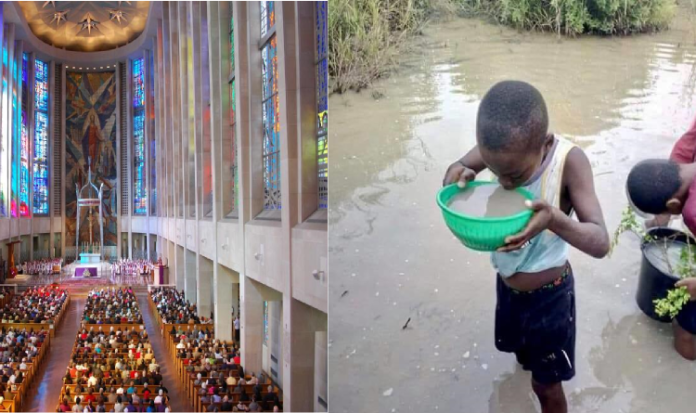 Teach us to ignore the needful and pursue vanity(in this case building a cathedral when our people don’t have portable water and other social amenities)? My friend, you are struggling with reading comprehension. I said that Eurocentric Education due to the new neocolonial world order (European American Dispensation) has cut off our balls. We have become docile, plaint, meek and peace-loving. Whatever those terms mean. Many of us don’t like a Cathedral, yet the Cathedral is going to be built. Massa, that’s all I said: We have no balls. Mental slavery is invisible violence and is worse than physical slavery. Because people in mental slavery become self-contained. Not only will they fail to challenge the system of thought that controls them, but they will defend and protect it virtually with their last dying effort. Imagine the millions of our people who were submissive and died believing what they were told to do will send them to a mythical paradise. The most imposing buildings in Ghanaian villages are the chapel and their mission houses, Coco buying center, and the market. They are paid stipends at the Cocoa center and they pay VAT at the market for the sake of the “development” of their country. Then Just calculate how much money leaves the collection bowls of the chapels every Sunday and all night programs all the way from the pastor to the Diocese and the Pope. Now take a cursory look around these imposing buildings to see the mud huts these citizens live in, their water supplies, toilets, schools, roads, etc. Meanwhile, they have people/”leaders” they “educated” and have voted for, to bring “changes and development”. For many decades, we have known that these “leaders” are incapable of using their brain and have become timid in the face of the oppressor, yet we as citizens do nothing and keep following the same path. Preach my bro. Me I have given up. These are indigenous lands being confiscated to build these structures. Without fair compensation to the people who are the original owners and inhabitants the government is colluding in genocide!! Stand up for your rights! What the cathedral is going to do to the people and future generations is worse than the compensation for the land. It is going to send them to HELL. See how beautifully you have typed in European language…. On a Foreigners Social media…. Given you avenue to reach people…. Create something of your own…. Too much talk…. Your obvious lack of historical insight make you spew rubbish while thinking you have said something. Seyram Amegadze What are we doing with the good education….? Reflect…. We talk and talk and after do more talking…..when we are done….then start blaming….and after continue to talk…. Now that is a shame. Wisdom should be translated into action not plenty blame games…. Get to work. Godfred Twum-Barimah, you are echoing what Narmer Amenuti is saying? We do nothing with our education. Our “educated” people are just FADED CARBON COPY Europeans and perpetual IMITATORS. We can’t even copy properly. On point. Anyway about one district one factory? How far? Hahaha. I just need updates ooo. No fight as the pidgins say. Remember l am non aligned as far as political parties in Ghana are concerned “oya”. Settlement of the political power question on the side of the majority is realised history making. Thus as fundamental not leaving chance to idealism or volunteerism. It must begin with creating their organised vehicles of mass mobilisation for opportunity making. Bottom-up gearing and not top-down and essentially; programme led and not gimmicky elitist bourgeois electoral vote winning promissory notes, history making is a forgone conclusion. The Kwame Nkrumah tangent on the three prong: liberation, emancipation and empowerment was not founded on volunteerism, patronage or paternalism. Rather on the conscious creativity of Peoples vehicles of opportunity making by the makers of history. The sort of tangent that in the process must bring about the political of: inclusiveness and not exclusions. At many levels bringing about organised, nationalism, patriotism and the spirit of selflessness. Programme led, service, in the interest of the: community, the nation aspirations, genuine interests, ability and potential realisations of the individuals and collectives can never fail. The project Kwabenya Atomic Energy would have been a dream pipe without the Physics Department of the US, now KNUST, or the then Eastern European socialist exchange, scholarship programmes. With the Committee’s of Youth Organisations, the “veranda boys” exclusions stopped. Onto the Workers Brigades under “Work and Happiness” United Farmers and Workers of Ghana, realisation of history making remains the legacy of genuine settlement of the political power question. How is the elitist bourgeois order going to stop the production line of the: Invincibles Forces, Deltas, the Hawks, Azokas and the Kandahars polity. Stephen Glala very enlightening premises and conclusions based on our dear father Dr Kwame Nkrumah’s policies and development plans. But my question is not answered. Are most of if not part of the huge loans taken by the present government going into formation of the promised factories.? I am not so worried about whether the USA truly is indebted or not. Thanks Emma Ama Gladzah. My candid. As it is the external and not the internal resources mobilisation is the wherewithal, the alfa and the omega. Situate on the neoliberal platform, acquiescence to and of the dictat the state evil, private messiah. Being the discord between pluralism of the political but the resonance with of economic entities. That discord primarily can only signals to non prioritization of: home made researched and informing development programme led or; peoples centred mobilisation and participatory gearing. Emma! Of the given template, success or failure determination in the process, can only be sourced from the gearing situate. From inside the box and not outside the box articulation. Moving on, it is at home and cannot be far fetched. One, of over thirty years implementation of the Economic (ERP) Recovery Programme and of the Structural (SAPS) Adjustments Programmes the answer or verdict was ‘inside’ the political economy template. The Bretton Woods institutions announced “Ghana the Success Story Pupils of Africa”. Still inside and not ‘outside’ the box, as well as moving on, the template doors offered yet another package. Being the “Highly (HIPICS) Indebted Poverty Countries Initiatives. Meaning, the Ghana “success” in succession, can be born out of, Indebtedness too. Never mind, neocoloniality is Good as is normal Indebtedness. We must be ‘happy’ of the news going around. That Vice President M. Bawumia, is about to get out of the dungeon. From the elitist bourgeois election votes catching gimmicky (1D1F, 1V1D) development promissory notes. Good thing, onto a development programme gearing. Hurray. Merry Christmas. 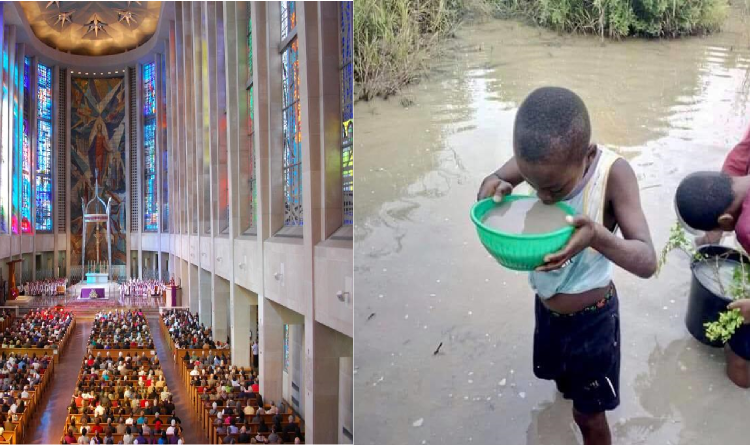 I wonder, Will the community keep the tithes from this cathedral?